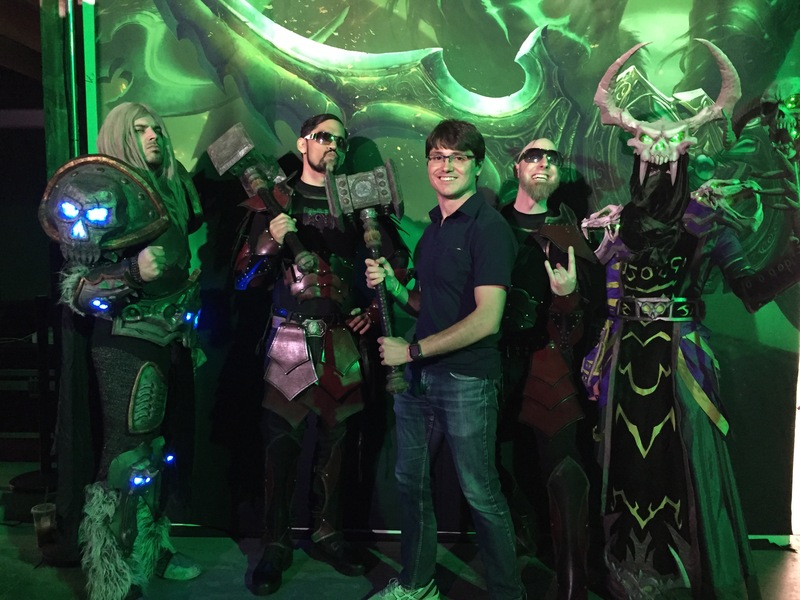 Legion launched at midnight last night, but the launch party started around 4:00 at the Esports Arena in Santa Ana. 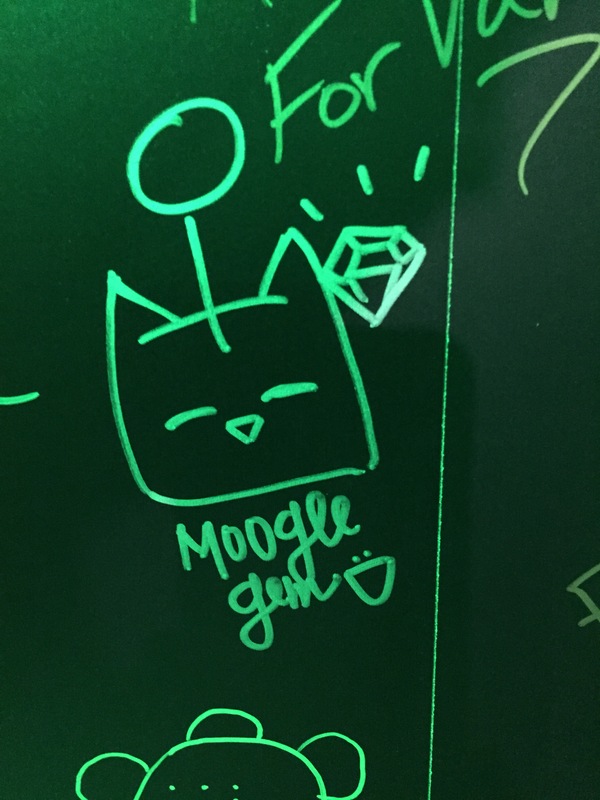 The room was filled with fel energy… or green lights. 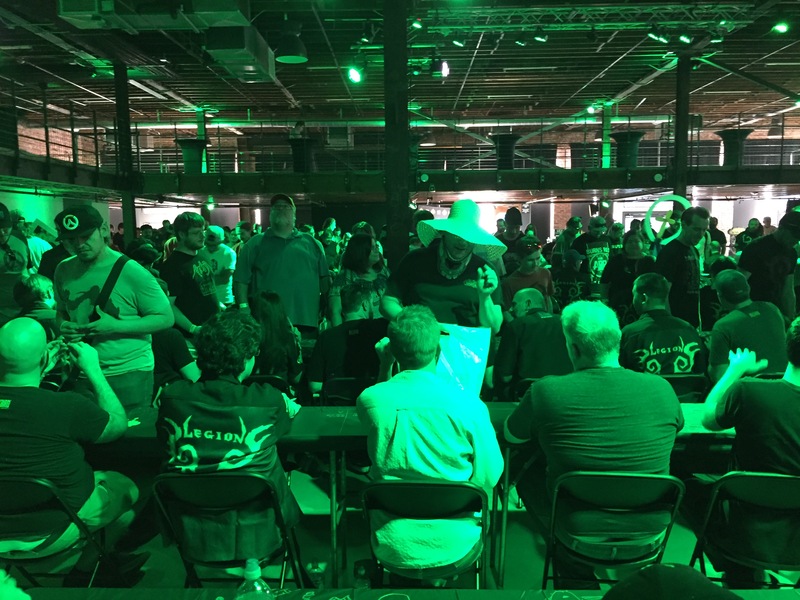 Blizzard suggested taking photos at the event to show you were in attendance “before all fel broke loose in Azeroth.” There was a store line so you could pick up as merchandise and a second line for the autographs. I went to the store first. I didn’t pre-order digitally because I wanted the physical collector’s edition. I have CEs of all the expansion as well as Diablo 3 and its expansion. I’m just missing classic’s. As a side note, I wish Blizzard would allow customers to pre-order digitally, then buy the physical CE and get the price difference added as game time. This expansion they let you buy both and gave you a key back you could give to your friend. All my friends have it already or were buying the physical CE. They don’t want a key. Here I am on the right with gem (Mooglegem), who planned on meeting me there, in the middle. We ran into our friend Tram, on the left, who also happened to be there. Awesome! 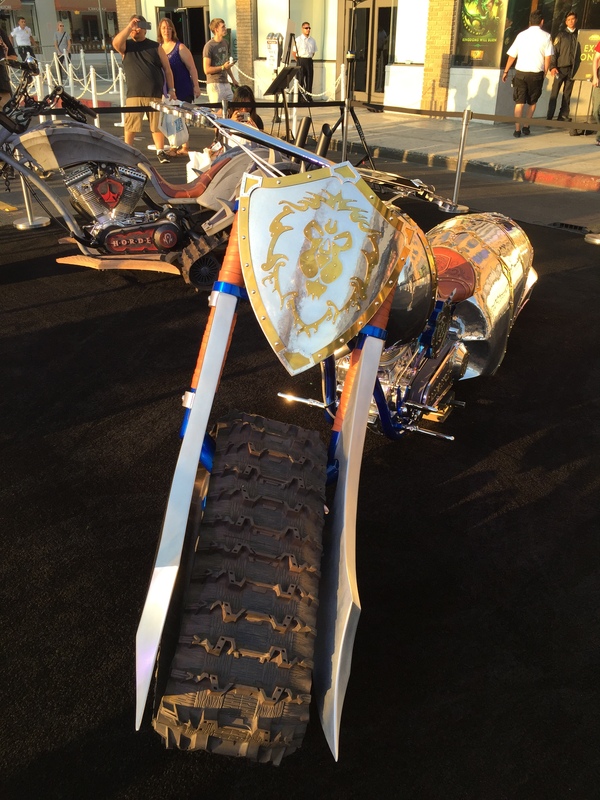 The Azeroth Choppers were there as well. 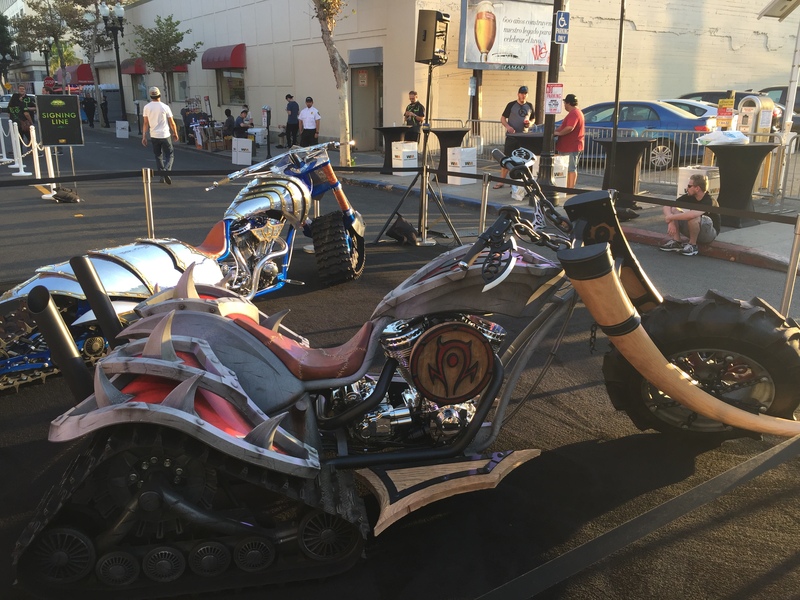 Of course the Horde motorcycle needs some spikes and tusks. Even though I main Horde, I prefer the Alliance motorcycle. How sweet is that shield on the front? 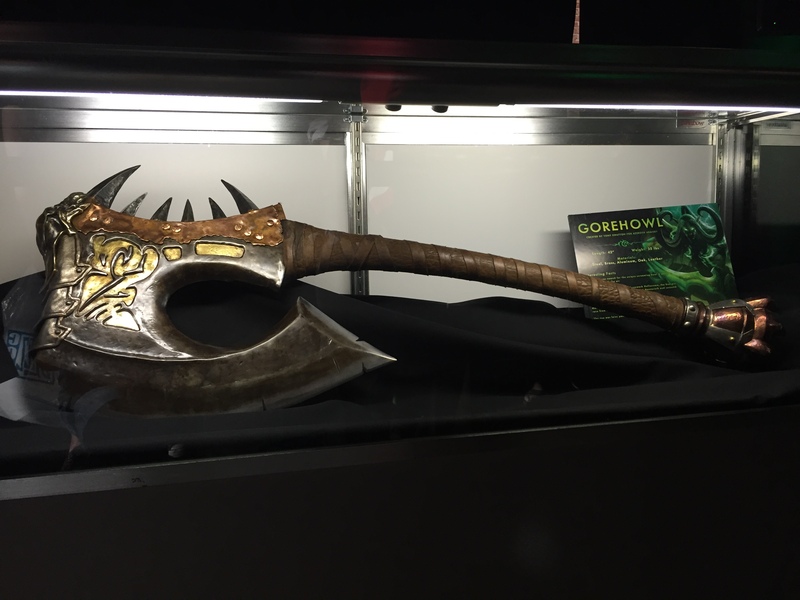 Gorehowl made an appearance. Now is this primary universe Gorehowl or alternate universe Gorehowl? Hmm. 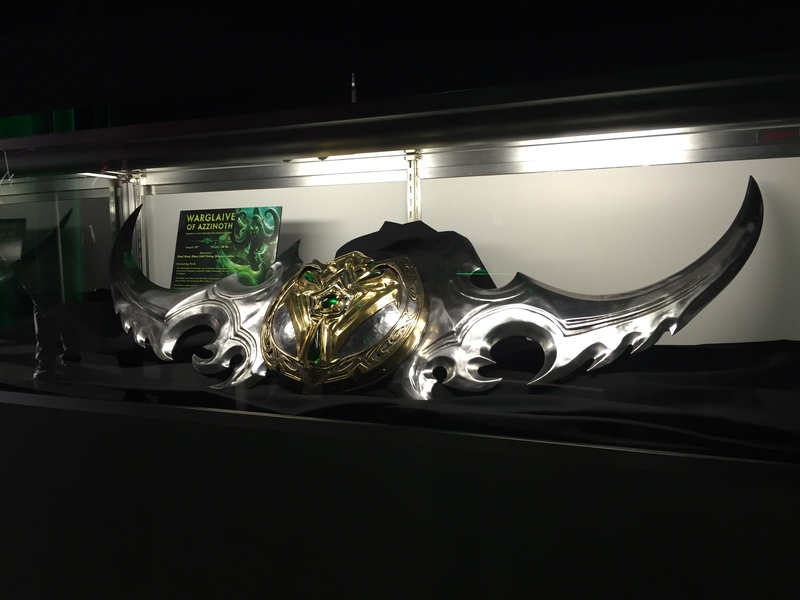 A Warglaive of Azzinoth was also there. This seems more appropriate for Legion. Lots of the developers took polls on various subjects. Usually it was what class or spec we’d be playing first. 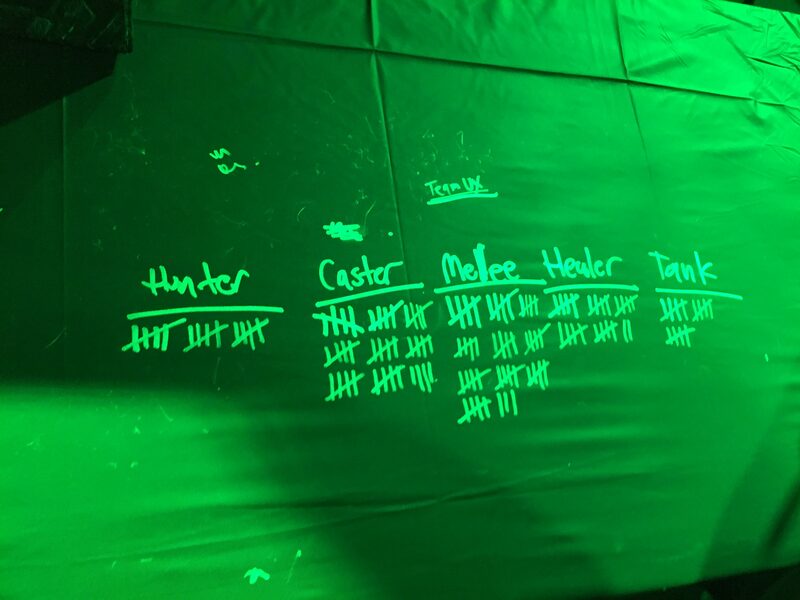 Asking with what zone we’d start was also popular, as was the ever popular “Alliance or Horde?” One dev asked what role we played – hunter, caster, melee, healer, or tank. Here are the results when I reached him with melee in the lead. 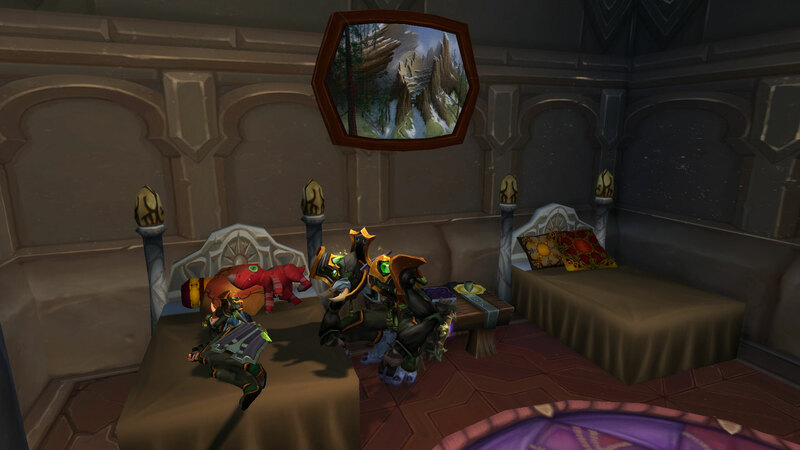 While talking with the prop designers, I mentioned the pink stuffed dinosaur in Dalaran. The woman I was talking to said something like “oh yeah, she made that” excitedly and pointed to the prop designer next to her. How cool! gem and I also made friends with the woman next to us in line, Kerry. Her husband is one of the developers, and we got to greet him too. It was fun having a new friend in line, and we exchanged e-mail addresses so we could be friends on Battle.net. 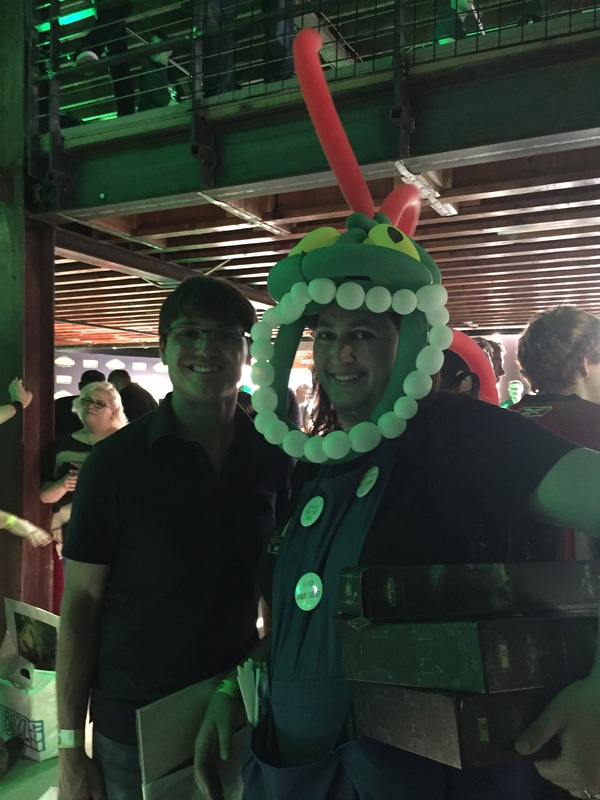 This woman was making awesome balloon props. She’s a murloc! 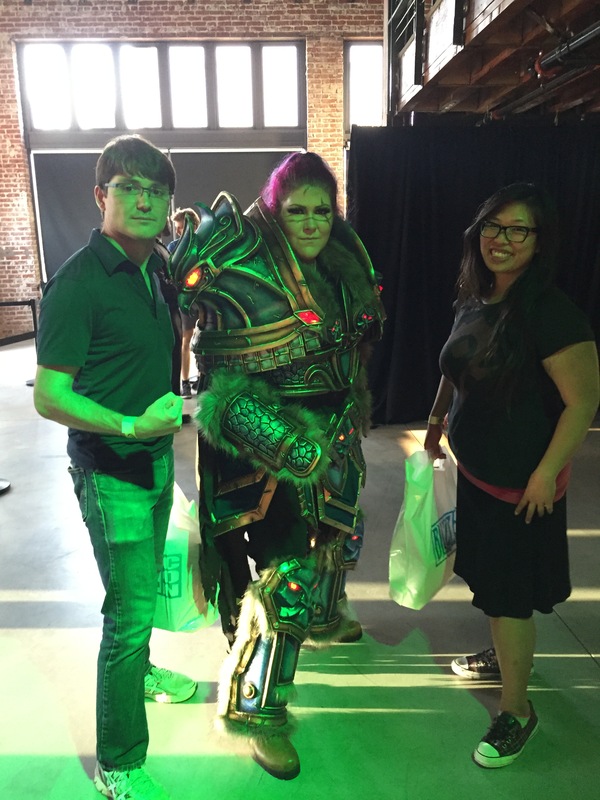 I later saw that @worldofwarcraft on Twitter retweeted some photos someone took of her. Sweet! 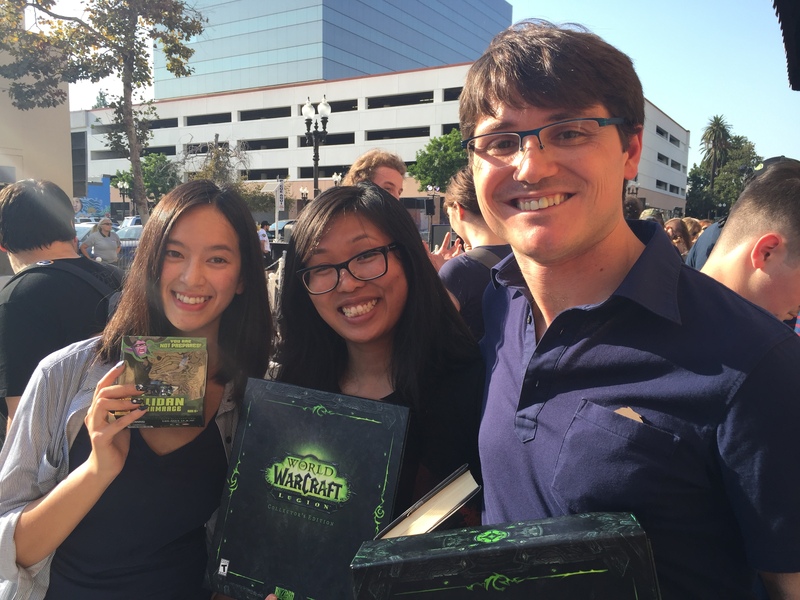 A couple of the developers had autograph books on the table and were asking for fans to sign his book as well. That’s a neat idea. 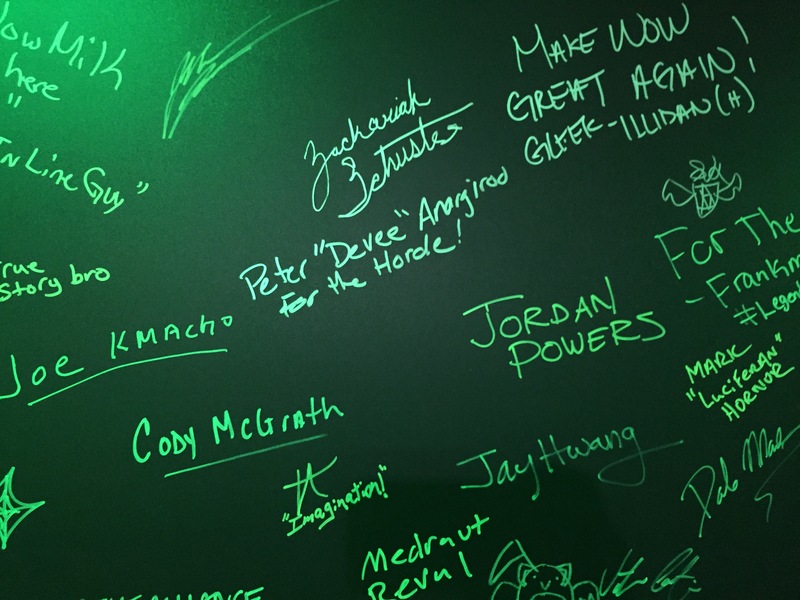 At the autograph line, there was also a wall for all the fans to sign. You can see mine in the middle of the above photo. I think gem’s is cooler! There was also some cool cosplay. We had to take a photo with this woman. Here’s some more World of Warcraft cosplay! Here’s the front of my box. 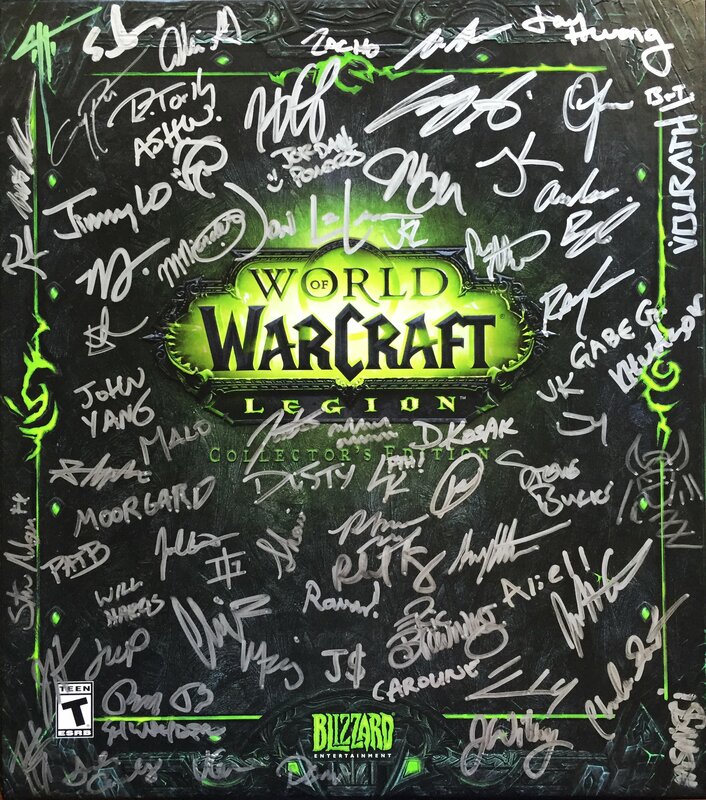 There are more autographs on the sides and back, but most of them are here. This was a really fun event, and I think it was better and more fun than ones I’ve attended in the past. I’m also really thankful it started early. There’s no reason to wait for midnight when the game can’t be played before that time anyways. Thank you, Esports Arena and Blizzard!